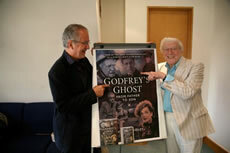 I am researching Godfrey’s Ghost, my book about my father, which is why I am on the telephone to Jimmy Perry, the creator and writer of Dad’s Army. At one point Jimmy asks me where I live. Jimmy’s right. I’d forgotten my father’s small brown attaché case and the badly-folded copy of the Daily Telegraph that he kept in it. He would always turn first to the obituaries page. ‘I’m just checking to see if I’m dead,’ he’d say. Next he’d try the crossword although I never remember him solving more than two clues. My father, Arnold Ridley, died twenty-five years ago. He will most often be remembered as Private Godfrey, the oldest, frailest member of the Dad’s Army platoon. There are those who will know that he was once a prolific playwright, the author of The Ghost Train, the classic comedy thriller that’s still played somewhere every night of the year. And there are others who will recall that he was the only member of the Dad’s Army team to have fought in both world wars and to have been twice invalided out of the army — once in 1916 after the Battle of the Somme and a second time after the evacuation from France in 1940. (He then joined the Local Defence Volunteers which later became the Home Guard.) But, for most people, the picture that remains is the meek, weak-bladdered bachelor living with his sisters, Dolly and Cissy, in Cherry Tree Cottage. This is not how I remember him; this is not who he was; and it is as Godfrey that I knew him least of all. In Godfrey’s Ghost, I have tried to paint a true portrait of my father, a remarkable man — courageous, steadfast, loyal — who lived an extraordinary life and lived it well. 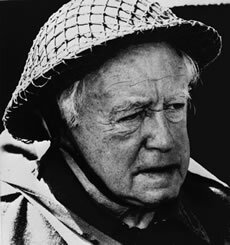 ‘Private Godfrey was a wonderful invention,’ said a fellow member of the cast, ‘and perfectly cast for Arnold Ridley because he was so sweet and gentle.’ Sweet and gentle? It’s a kind tribute but is it true? For Charles Godfrey, the retired gentleman’s outfitter, the answer may be, ‘yes’, but for my father, Arnold Ridley, it would be safer to say, ‘yes and no’. 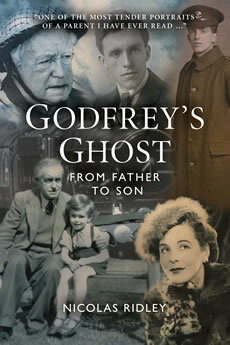 One of the joys of writing Godfrey’s Ghost has been to bring my father back to me; to see him and to his voice again. I hope readers will enjoy learning more about Arnold Ridley. As Jimmy Perry describes him, ‘soldier, playwright, actor, inspiration for dear old Private Godfrey’, as Jimmy Perry puts it. And more than that. A wonderful father. An admirable man.